In 1990 Albright Church took a step of faith to pursue God’s vision by selling its former property and meet in a school for 3 years. Since that time, the tag line for that faith step “Our Sacrifice – God’s Miracle”, became a reality. In response to the significant sacrifice of Albright people, we now have a wonderful piece of property and a fine facility that is mortgage free. But God’s miracle has been far greater than providing us with this building and 5 acres of prime land. His greatest miracle is evident in the lives that have been changed and continue to be changed. Albright planted a daughter church in 1985 and, after moving into this facility, planted another daughter church, River’s Edge, in 2006. Since then, we have continued to grow numerically as well as have seen our impact for God’s Kingdom reach far beyond Sunday morning. The number of people, at all stages of spiritual seeking and maturity, who call Albright their home, far exceeds the Sunday morning attendance numbers. We are a community of faith that not only gathers together but also lives each and every day in a way that is making Christ known to a world that needs Jesus. As we continue to live out our Vision and Mission Statement, we continue to grow numerically. When comparing month to same month attendance, we regularly see a new highest monthly average since River’s Edge was planted. But we are so much more than a Sunday-gathering congregation. While we have space on Sunday mornings within our two services and could add a third service to accommodate continued growth, we are often maxed out during the week in the evenings. Our building is heavily used throughout the week and it can be difficult to find a meeting space. When space is available for such ministries as Grief Share, Marriage Course, Foundations for Life, etc., the space is often less than ideal. One of the great motivations behind the site plan and expansion design is to bless our neighbourhood. Blessing not only the immediate neighbourhood of Countryside Crossing, but the neighbourhoods in which we all live, work and socialize. By creating a campus with facilities that we can bring our friends to and make available to them, we regularly remind ourselves that we have a mission assignment to engage with the world by breaking down barriers. Whether it is a plaza area, comfortable meeting rooms of various sizes, or a café where relationships can be built, this expansion says to everyone that Albright Church is about people and relationships. As we arrive once again at a historical moment, similar to the moment when courageous and obedient decisions were made to make it possible for us to be the type of church we are today; we are facing a huge step in our life as a faith community. I am calling you to embrace the vision of expanding our facilities so we can engage with those around us and provide space that is needed throughout the week for current and future ministries. I invite you to join in the excitement about how an expanded facility can be used as a tool in providing life-changing ministry environments for those who are part of Albright, as well as those who are not but are loved by God and by us. As it has been throughout Church history, when it comes to decision-making we are motivated and inspired by God’s grace in our own lives, and the sheer joy of being able to witness God’s grace at work in the lives of many. So, would you continue to pray for Albright’s leadership, ministry and expansion? Specifically pray about how you will lend your support to approving the motions the Elders bring to the Annual General Meeting on June 11/15, as well as your ongoing generous financial support to our budget and the future Capital Campaign. God will continue to do even more than we can ask or imagine. We want to express our sincere appreciation for the conversations that are occurring in response to the various changes in the life of Albright Church. We are so excited by the great momentum that Pastor Nathan is contributing to as he embraces his new role of Associate Pastor: Community Initiatives and Worship Arts. In response to Pastor Alan’s expressed desire to retire by July 2016, we are looking to replace our Lead Pastor. We are also in the middle of developments around our property. There are very recent developments and announcements regarding the overpass at the Perimeter Highway and Lagimodiere Boulevard/Highway 59, and connecting the walking trail that runs parallel to Gateway and Raleigh on either side of the Perimeter Highway. Homes are also popping up in the Countryside Crossing Development. Adapting to these changes requires flexibility, and trust. During the years leading up to the move to this property in 1993, the congregation of Albright believed wholeheartedly that this specific location was where God wanted this church to settle. At the time, we were in the middle of a field, on the outskirts of both the City of Winnipeg and the RM of East St. Paul. The congregation did not know exactly how God would use them in this new location, but they trusted in God and His plan. Only now, 22 years later, are some of the answers to those kinds of questions coming to light. God continues to lead this church and build His kingdom. He has more in store for us as we fulfill His calling to be His light and salt in this part of His community. Starting in 2004, Albright has been operating according to a very clear vision given to us by God. "As a Great Commission Church, we will consistently reach un-churched people for Christ, welcome them into our caring church family and equip them to become reproducing disciples. Albright will become a church where people are encouraged and empowered to develop their personal ministry based on God’s call and gift, with a mindset of multiplication. All ministries taking place in and through Albright Church will be built upon personal and corporate prayer in reliance on the Holy Spirit. Our leadership model will be team ministry with a Christ-like servant attitude. Small groups will be part of this well-defined leadership development process. Cutting edge technology will be utilized to reach people both in and beyond our community. This vision of maximizing our impact in the world, and of raising up disciples of Jesus, directs all of our decisions and initiatives. This vision gives Albright Church direction to accomplish God’s commandment to: make disciples of all nations, baptizing them in the name of the Father, Son and Holy Spirit, and teaching them to obey all of His commands (Matthew 28:19-20). Our direction is already set. The expansion that is being discussed is another tool to use as we continue to implement our vision. The new Lead Pastor will not alter this vision. He will further it. He will bring us all closer to accomplishing this vision. 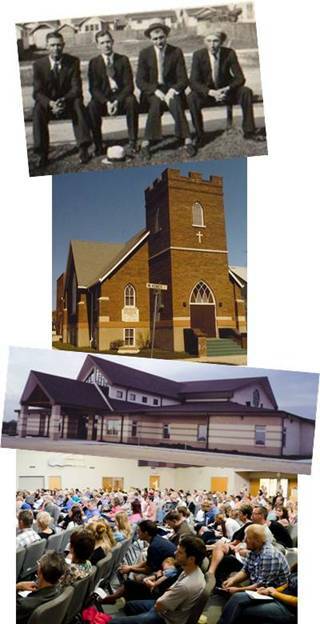 In 2004, the Elders decided that Albright Church would be a vision-driven church, not a church that follows the leader. Instead, the leader follows the vision. Since our last conversation at the Family Chat on April 7/15, we have received some very valuable feedback. We want to take this opportunity to convey our appreciation to all of you who took the time to approach a staff person, Design Team member, or Elder to discuss the vision for the expansion. The process that the Design Team and Verne Reimer Architecture (VRA) have been undergoing for most of the past year has established a proposed two phase expansion Site Plan. Phase 1 will include renovation of the existing facility, construction of a new link building with ministry & office space, and exterior site work. Phase 2 includes a future Worship Centre. Through the process of determining priorities to accomplish our vision, the Elders believe that Phase 1 is the most efficient and well-stewarded way of accomplishing Albright’s vision. We do anticipate and pray for growth in our Sunday morning attendance as we all become more intentional in being whole-hearted disciples of Jesus, and in doing life with our friends, co-workers and neighbours. However, these expansion plans are not driven in the least by a desire of using a new building to increase our congregation size. We believe that God will draw people to Himself, and we must be His willing workers to minister to them. Our vision is not at all driving us to become a ‘mega-church’. We are simply following the leading of our Lord to be good stewards of all He gives us, and to live a life fully devoted to becoming and making disciples of Him. All of these discussions and plans are for His glory. We believe that it is important to reiterate the cost of the proposed Phase 1 (the renovation and addition to the existing building, the new link building and all site work around those two buildings). The grand total is very close to $10 million, once taxes are included. VRA has supplied us with a very complete breakdown of these prices. The Design Team has and will continue to work with these numbers to advise the Elders on various options for moving forward. They have been instructed to examine whether it is possible and cost-effective to break down Phase 1 into multiple steps. Any multi-step approach would take the overall site plan into consideration in order to ensure that all work that is necessary for future steps (including the worship centre) happen at the appropriate time in the process. Throughout the coming months and years of transition and progress in keeping with our vision, the Elders are committed to continue the dialogue with you and maintain strong stewardship values. Please address any concerns or ideas that you may have to an Elder. We want to ensure that everyone is cared for and heard as we navigate these exciting changes together. As we get ever closer to these expansion plans becoming a reality, here are several milestones that need to be accomplished along the way. This list is not meant to be exhaustive, but to give you a realistic idea of the upcoming steps. a) Determine which option to choose: expansion, church-planting, or multi-campus setup. (Accomplished by the Next Steps Team in June 2014). b) Commission an architect to develop a picture of our property that conforms to our vision. (Accomplished with VRA and the Design Team in 2014-15). 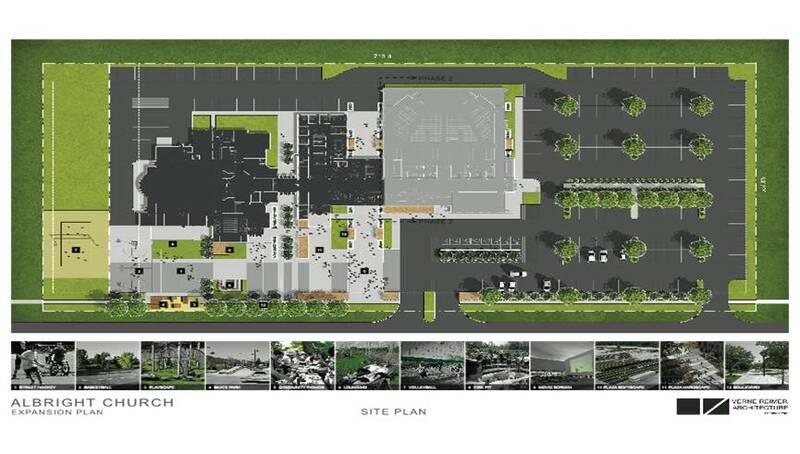 c) Approve proposed site plan as our future goal. d) Secure necessary variances and approvals from the surrounding community and the RM of East St. Paul. e) Funding from the congregation begins to accumulate in the Next Steps Fund. f) Establish a Capital Fundraising Campaign. h) Tender most aspects of the project. i) Put a shovel in the ground. ­ - creating more effective space for Albright’s many current and future ministries on and beyond Sunday morning. That the site plan be approved as our long-term expansion vision so that all incremental projects to develop our campus will be done with the site plan and good stewardship practices in view. Note regarding motion #1: In approving the site plan it is recognized that the drawings are not yet construction plans, so adjustments and realignment of certain spaces may still take place. That the membership authorize the spending of up to $100,000 on projects to develop our campus in keeping with the site plan. That authorization be given to proceed with securing the necessary variances and approvals which will be required for the expansion project outlined in the site plan to allow for the development of our campus over the coming years..
That funding for our expansion begin by encouraging people to start donating over and above gifts to the Next Steps Fund and secure a Capital Campaign Fundraising company at an appropriate future date. Note regarding motion #4: Possible target date of April 2016 is being considered by the Elders to secure a Capital Campaign Fundraising company. renovating our current facility to provide storage and mid-size meeting rooms.